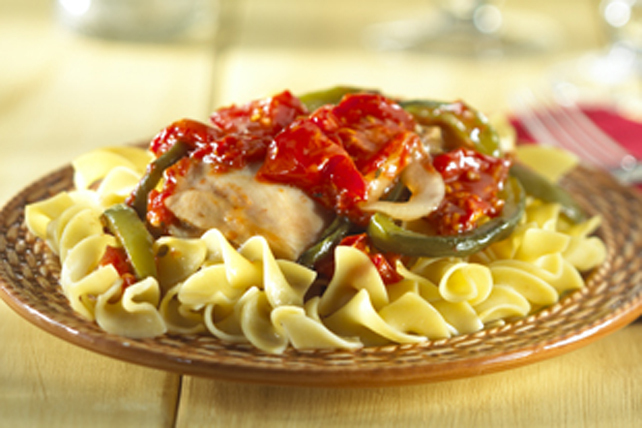 Classics never go out of style and this chicken cacciatore is no exception. We use just chicken thighs in this easy-to-make recipe since they stay juicy even after the long baking time. Heat oil in large nonstick skillet on medium heat. Add chicken; cook 5 min. on each side or until thighs are evenly browned on both sides. Transfer to 3-L casserole dish sprayed with cooking spray; top with onions and peppers. Combine remaining ingredients; pour over ingredients in casserole dish. Cover. Bake 45 min. to 1 hour or until chicken is done (165ºF). Substitute 25%-less-sodium chicken broth for the wine.